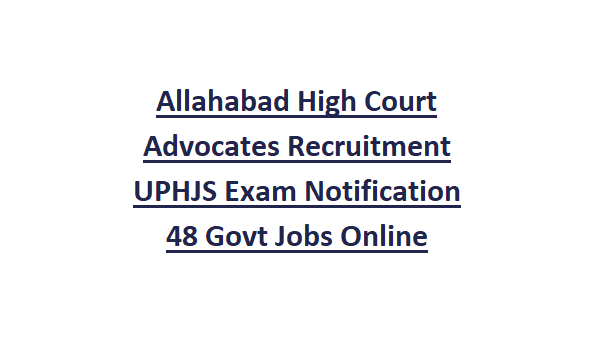 There are total 48 posts in this Allahabad High Court recruitment 2018. 30% of posts are reserved for female candidates. As on 01-01-2019 candidates age limits are 35-45 years. For SC/ST/BC candidates age limits are 35-48 years. Candidates must have 7 years standing (practice) experience for applying this Advocate jobs under UPHJS. Selected candidates initially have to work under probationary. For general/OBC candidates exam fee is Rs.1000/- and for SC/ST candidates exam fee is Rs.750/-. Candidates selection will be based on preliminary written exam and mains examination for this Advocates jobs for AHC. 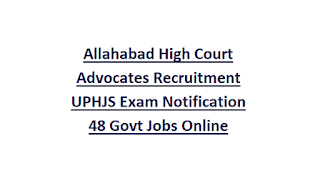 The recruitment will be based on a preliminary examination (objective type), consisting of 100 marks of two hours from syllabus on OMR Sheet to be held on the above date at Allahabad & only those candidates shall be called to appear in the Main Written Examination who secure 45% or more marks in the Preliminary Examination provided candidates not more than 20 times of number of vacancy category wise i.e. separately for General/Unreserved, SC, ST & OBC shall be admitted to the Main Written Examination. The candidates securing 45% or above in the Main Written Examination shall be called to appear in the interview subject to maximum thrice the number of vacancies category ­wise. For prelims exam syllabus refer official website of http://www.allahabadhighcourt.in. Online applications only accepted for this AHC recruitment of Advocates posts. Last date to apply online for these Advocates jobs is 14-06-2018. Filled and online submitted hard copy of application printout must have submitted to respective district sessions court judge on or before 30-06-2018. For more details refer official website.